If you are planning using towbars to tow a car on it’s wheels behind your vehicle or motorhome there are quite a few items you will need to purchase to get your rig set up properly. First and foremost, towing in this way can be expensive in the initial outlay of money. 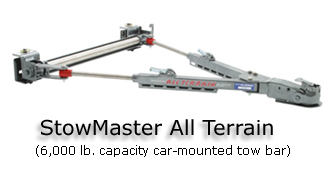 If you are only towing something once you may want to consider a tow dolly where the vehicle rests two of it’s wheels on a little trailer that you tow. Otherwise, it doesn’t make financial sense unless you plan to tow often. 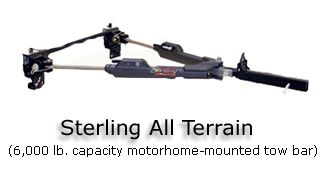 The Sterling All Terrain weighs just 35 pounds, yet pulls up to three tons. Steel and stainless steel at every critical point ensure superior strength and structural integrity. ROADMASTER's new BlackHawk 2 All Terrain tow bar comes with 10,000 pounds of carrying capacity, plus ROADMASTER's exclusive All Terrain non-binding technology. The BlackHawk 2 is a beefed up version of ROADMASTER's popular BlackHawk All Terrain, with an additional ton of carrying capacity. That's more than enough muscle to tow Suburbans, Hummers, Excursions and full-size pickups. 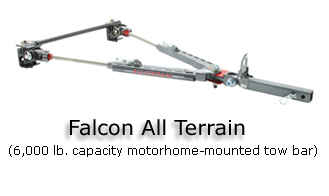 The Falcon All Terrain has all the same great features as the Falcon 2 tow bar, with the addition of ROADMASTER's exclusive All Terrain non-binding technology. With an All Terrain Freedom Latch™, you'll never struggle to connect or disconnect your tow bar. The Freedom Latch releases the tow bar at any angle, level or bind the first time, every time. The StowMaster All Terrain has all the same great features as the StowMaster tow bar, with the addition of ROADMASTER's exclusive All Terrain non-binding technology. With an All Terrain Freedom Latch™, you'll never struggle to connect or disconnect your tow bar. The Freedom Latch releases the tow bar at any angle, level or bind the first time, every time. All of this equipment assumes that your towed car is set up for towing. What do I mean by that? When you tow a car, the car is not running, right? Well if the car is moving, the transmission is turning, but if the car is moving while it is not running, there is no transmission fluid lubricating the parts. Guess what this will do to your transmission? Destroy it, you’d guess? You betcha. So how do you avoid ruining your transmission while towing? The good news is that some cars like most Saturns and Hondas are already set up for towing. Check the owners manual for the exact instructions on how to set the vehicle up for towing. Many stick-shift cars can be put into neutral for towing as well. Many 4 Wheel drive vehicles with a neutral position in the transfer case can also be towed because this position disengages everything. For every other kind of vehicle, you must do one of three things to solve the problem. Replace the drive line with a drive line disconnect unit which allows you to disengage the transmission manually (through a switch under the seat). For front wheel drive vehicles, you can install an Axle Lock system. For every other car that does not have these options available, you must install a lube pump that circulates the transmission fluid when the car is not running. Eyers Trailer Hitch Center installs and services products such as lube pumps, axle locks and driveline disconnects to allow your car to be towed on all 4 wheels behind your motorhome or other tow vehicle. 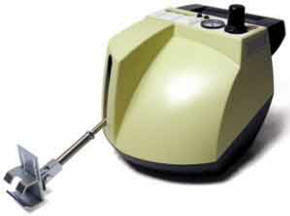 You can learn more about the lube pump at www.remcotowing.com. There is one other option for some Ford vehicles. Ford has come out with a computer chip that can be installed on some of its vehicles that will allow you to put the push button transfer case into neutral. One other item you may want if you plan to tow this way is a speedometer disconnect. This allows you to tow the vehicle without racking up extra miles on the odometer as well as disconnecting the speedometer. Nowadays, most states and Canada require you to have a braking system installed on your towed vehicle. Canada won’t let you in if you don’t have one! We love the Brake Buddy system which is easy to set up and transfers to any another vehicle with ease. It comes with a radio-controlled monitor for the coach, breakaway system and cover. Brake Buddy Braking System for towed vehicles behind a motorhome. The Brake Buddy auxiliary braking system improves towing safety by providing an effective easy to use supplementary braking system for your towed vehicle. 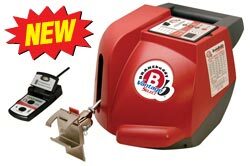 This helps make towing with your motor home safer and more convenient. The BrakeBuddy Vantage Select features a new technological advancement making it the only portable auxiliary braking system that allows you to choose between Full and Proportional braking technology at the touch of a button. As you can imagine, all this equipment starts to add up. But if you are planning to tow often, it really is worth the expense just to have your car with you for driving once you get where you’re going. For many people this is the best way to go. It gets very tiring dealing with an extra tow dolly or car trailer when you travel a lot. These are general guidelines. Different towbars will have slightly different steps. Drive the car into position behind your motorhome or vehicle. 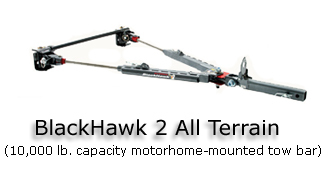 Hook up the two arms of the towbar to the baseplate on the towed vehicle. Attach the coupler of the towbar over the ball or insert the towbar into your trailer hitch on the motorhome. Attach your safety chains or cables. Plug the electrical pigtail cord into each vehicle. Place the key in the ignition of the towed car and key to the position where the steering wheel is unlocked. This is usually in the first “click” position. Depending on the car, either place the transfer case into neutral, or place the stick shift into neutral, or disengage the drive line with the disconnect switch or engage the lube pump. Install your braking system, if applicable, and connect the breakaway switch. Test all lights, and double check all systems that they are in working order. Sounds real easy doesn’t it? 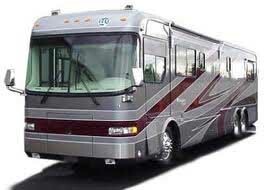 I’ve been told that most divorces are not over the kids or money, it’s over trying to hitch, unhitch and park an RV! Practicing and becoming a pro at all these skills could just save your marriage! See my Tips and Techniques article for insider tricks on backing and parking. 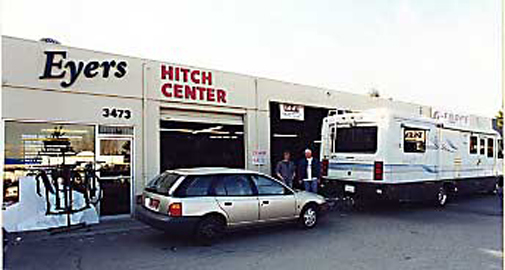 Eyers Trailer Hitch Center, Inc.